How many of you remember going to Children’s Concerts on school field trips? How many of you remember going on similar trips to the local art museum? That may seem out of character for one’s picture of growing up in a working class, steel-making town. But that was part of my experience of growing up in working class Youngstown. I’m not sure I necessarily appreciated this that much at the time, other than the chance to get out of the classroom. But now I realize that we were being exposed to some of the cultural treasures of my city and being reminded that there was more to life than hard work in a factory (something I think those who want to eliminate the arts from education today need to think about!). I think there was a perspective, perhaps spiritual in nature among those in the working class, that realized that life was about the good, the true, and the beautiful. We loved good food and other good things of life, were often devout in our religion, and treasured both natural and man-made works of beauty. While both of our fathers were never able to pursue artistic interests, we have free hand drawings each of them rendered that show considerable talent and an eye for the beautiful. What I only realized after moving away from Youngstown is just how culturally rich the city was and is when it comes to the arts. I think first of the Butler Institute of American Art. Located next to Youngstown State, it was a wonderful place to take a break from studies and wander through the galleries, looking at the Remington paintings of Native Americans. Perhaps my favorite painting was Robert Vonnoh’s In Flanders Fields. We were in the Viet Nam era and the painting served as a visible reminder of the tragic and futile loss of young men’s lives in war. In later years as we visited other art museums including the one in our own city, we came to realize what an incredible treasure Youngstown has, confirmed particularly among artist friends of ours. But the tour of the arts in Youngstown just begins here. 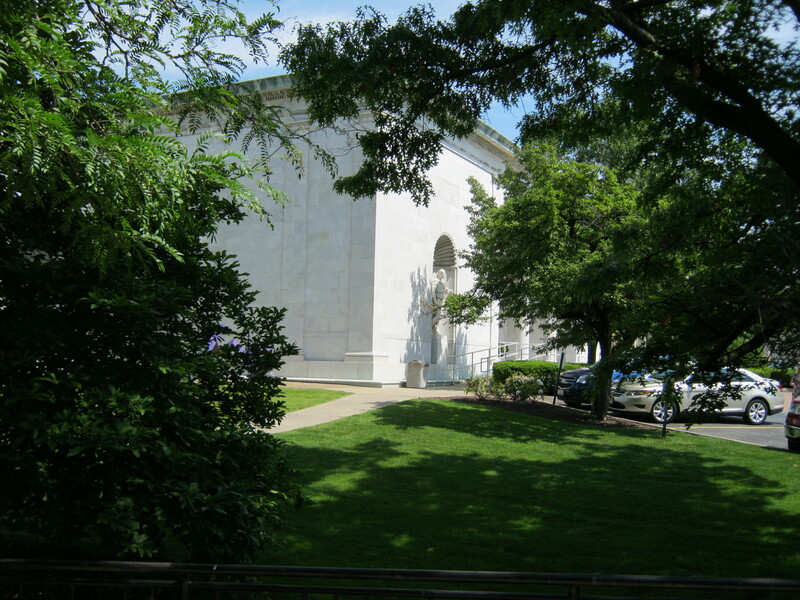 There is the John J. McDonough Museum of Art, a contemporary art museum across the street from the Butler and part of the Youngstown State campus. John McDonough was a physician (my mother’s in fact) who built a notable collection of contemporary art and contributed to the construction of the museum through the sale of Gloucester Harbor by Childe Hassam, contributing the proceeds to help finance the museum. I remember going to Children’s Concerts of the Youngstown Symphony at Stambaugh Auditorium. Later, the Symphony moved into Powers Auditorium, the old renovated Warner Theater, which is now part of the DeYor Performing Arts Center. As college students, I remember going on dates on cheap student tickets to see The Nutcracker and other performances, which nurtured my love for symphonic music. We also went to plays at the Youngstown Playhouse, considered one of the older community theaters in the country, tracing its history back to 1927. In the years since we’ve left, the arts have continued to develop in Youngstown. The Oakland Center for the Arts, located in downtown Youngstown, fosters the development of new works from the various communities of Youngstown around current issues of justice, supporting emerging voices. The Artists of the Mahoning Commons now utilize the old Ward Baking Company building for studio space as well as arts events. I suspect there is far more going on than I know. Also, there are more arts organizations than I’ve been able to talk about in this post, a listing for which may be found at the Power of the Arts website. While neither my wife nor I make our living in the arts, we both deeply value artistic expression. My wife is an acrylic and water color painter (who first exhibited her work at the Canfield Fair Art Show!). I sing with an accomplished community choir, Capriccio Columbus as well as write. While it took many years for us to pursue artistic interests even this far, we are both convinced that they were formed during our growing up years in Youngstown. What are your memories of the arts growing up? What artistic institutions in Youngstown (or your home town) do you treasure? Oh yes, I remember those Children’s concerts and taking Saturday Art classes at the Butler Art Institute. They offered both painting and sculpture classes when I was a kid. I also remember musicals, plays, choirs, symphonies, and all kinds of guest performers at Stambaugh Auditorium; loved being a High School usher at the Stambaugh because I got to see so many things free. I remember visiting my parents and going to see Victor Borge perform at Stambaugh, and then getting on a plane the next day and there he was. It was a thrill to just chat him up. Wasn’t there a historical mansion that was a museum for a time, over near Wick Park? I may be thinking of the Stan Hywet Hall and Gardens in Akron. There was some lovely old architecture in downtown Youngstown, too; I am thinking of the old Federal building – is it still there? The first musical I ever saw as a child was Babes in Toyland at the Youngstown Playhouse. I think I was seven years old and I can still remember it clearly. You could also drive over to nearby Warren to the Warren Playhouse for amazing productions of Oklahoma and South Pacific. My brother took me to see Oklahoma over there when his date couldn’t make it. Thank you John. Our high school, Rayen, had the best A cappella Choir in the city (if I do say so myself), thanks to Mr. Miller, and we also had a very popular Thespians group. We performed some terrific plays; To Kill a Mockingbird, Our Town, Death of a Salesman, to name a few. Thank you Bob, for reminding us of our cultural heritage. Thank you Nancy for sharing your memories of that cultural heritage! I see that the Mahoning Valley Historical society did a Bites and Bits on Idora Park today and showed a movie. Now, that would have been fun to see. Idora Park was not exactly art but it was cultural in some sense and a real part of Ytown history. You are right about that. I hope to post on the park some time because it is such a part of the historical fabric of Youngstown. I now live near Blossom Music Center and we spend our summers listening to the wonderful Cleveland Orchestra here. I often think back on, and am grateful for, those elementary school days spent at the symphony in Youngstown. Those concerts including children’s favorites like “Night on Bald Mountain” and “The Sorcerer’s Apprentice” and the classroom preparation leading up to concert day gave me a lifelong love for classical music.